Mercedes needed a strong response after losing to Ferrari in Australia and whereas in that first race it was Mercedes that made the wrong call to pit first, here Ferrari rolled the dice and took a risk on pitting Vettel first as the track became ready for a changeover from intermediate wet tyres to slick tyres . It didn’t work out because soon after Vettel’s stop the Safety car was deployed for a big accident by Giovinazzi in the Sauber. It’s always more efficient to pit under a Safety Car in terms of lost time and so the cars that had got ahead of Vettel when he pitted – Raikkonen, Ricciardo and Verstappen –were able to pit for new tyres and retain the advantage over Vettel, After that it was all about Vettel fighting back through the field to finish second, rather than challenging Hamilton for the win. But it looks like an exciting season ahead. It was another masterclass in mixed conditions driving from Max Verstappen. The 19 year old Dutchman is an exceptional talent and this was demonstrated again as he passed nine cars on the opening lap in damp conditions. 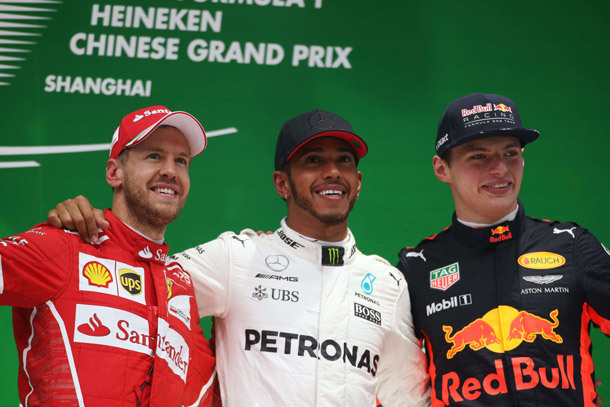 Verstappen started 16th after problems in qualifying and finished on the podium in third place. Some of his overtakes were sublime, including the one on his team mate Daniel Ricciardo into Turn 6, which at that point in the race was the only potential overtaking spot that wasn’t wet on the inside line. 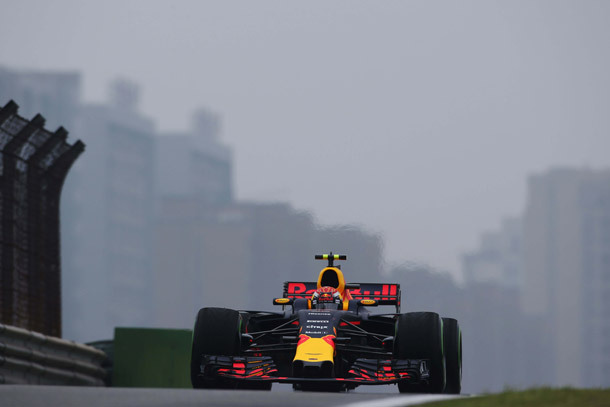 At the end of the race, Ricciardo caught his team mate at the end and challenged for the podium, but Verstappen held him off to get an important psychological boost in their intense family battle. But the fact remains that the car was 1.3 seconds slower than the Mercedes in qualifying and Verstappen finished 45 seconds behind Hamilton in the race in a 56 lap race. Red Bull will improve but they are too far off the pace at the moment. The downside of the rule changes is that the field has spread out significantly. The top two teams are way ahead of Red Bull, who in turn are way ahead of the midfield runners. But the midfield battle between Williams, Toro Rosso, Force India and Haas is going to keep us entertained all year. Here in China, Williams had an off day with neither driver scoring points, despite qualifying 6th and 10th. They can’t afford to keep doing that if they are going to finish in the Top four in the championship. Force India brought both cars home in the points, while two standout drives came from Carlos Sainz in the Toro Rosso and Kevin Magnussen in the Haas. Magnussen started 12th and finished 8th, while Sainz qualified 11th, was the only driver to gamble on slick tyres at the start, raced with Raikkonen and Verstappen on occasions and managed to come him 7th. Fernando Alonso did another excellent job in the mixed conditions, running in seventh place, but as it dried out and he started losing positions to faster cars, reliability issues kicked in and he had to retire with a driveshaft failure.